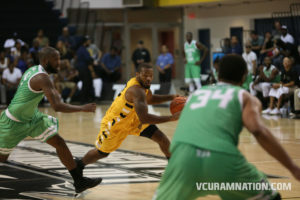 For their 3rd year in a row, team Ram Nation will take part in The Basketball Tournament. TBT is a winner take all tournament of 72 teams where the last team standing wins $2 Million. This year, Ram fans got lucky. One of the locations for the opening rounds will be played at the Siegel Center. Team Ram Nation will play on Saturday, July 14th at 8pm. You can purchase tickets here. The roster is basically your favorite VCU players in recent history, B. A. Walker, Jamal Shuler, Jordan and Bradford Burgess, Brandon Rozzell, Darius Theus, Eric Maynor, Melvin Johnson, Juvonte Reddic, Jesse Pellet-Rosa, Justin Tuoyo, and Reggie Williams (VMI).